Q: I have found that I am not good at selecting a contact point on the object ball with the cue ball. Maybe you can help. Seems to me that on a 45 degree cut, I select the point on the object ball, which is easy. To hit that point, I have to line up the cue ball to hit that spot by lining it up at the far edge of the cue ball. If I do it by sight, I will hit it too full. Just cannot seem to see where the cue ball will hit the object ball. Any suggestions? A: The first thing to understand is that there is a big difference between the contact point on the object ball and the cue ball aiming point. To find the contact point, line up your cue stick from the base of the object ball below the highest point to the desired pocket. The point furthest from the pocket is your contact point. An easier way to identify the contact point is to visualize the spot on the object ball equator that you would tap with a hammer to pocket the ball. Now because the cue ball and the object balls are round, the only time that the contact point is the aiming point is on a straight in shot. So on any cut shot, if you aim at the contact point, you will hit the object ball too full. 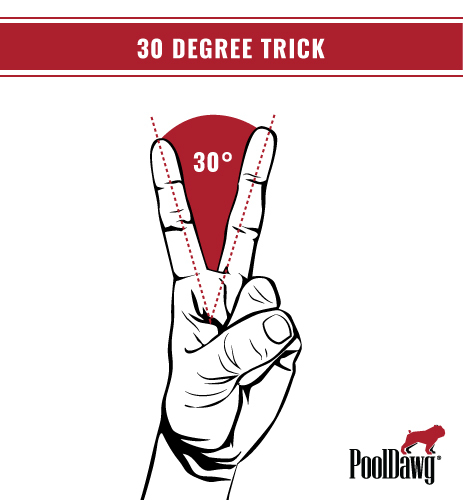 Here is a “Handy” trick to give you an idea of what a 30 degree cut angle looks like. Any time the cut angle is greater than a peace sign, you should be aiming outside of the object ball. Inside of peace sign you will set your aim point somewhere on the object ball. Some hands may be different so be sure to experiment on the practice table first, but this will get you pretty close! Now that you know where to aim, the next step is making sure you have a repeatable, reliable stroke. If you can't hit the cue ball where you want, it doesn't matter where you’re aiming. 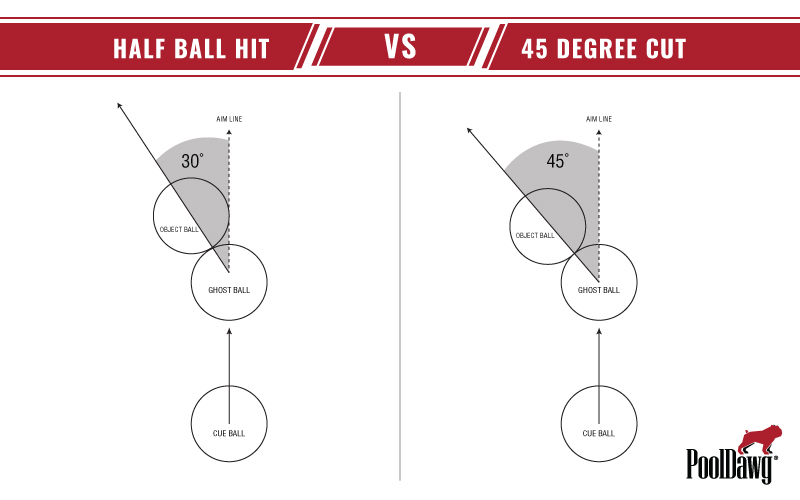 A key idea/skill in aiming is making sure you are striking the cue ball on the vertical axis. The only time the cue ball goes in the direction the cue stick is pointing is when the cue tip hits the vertical axis of the cue ball. Check out my other articles, including A Simple Drill To Improve Your Game to work on your stroke fundamentals. If you have any questions, give the folks at PoolDawg a call at (866) 843-3294 or send them an email at info@pooldawg.com and they'd be happy to help you out!